Boston, Oct. 27, 2014 – Kyruus, a leading provider of cloud-based Patient Access and Referral Management Solutions, announced today that Partners HealthCare has selected Kyruus ProviderMatch to power its Find-a-Physician tool. The solution will enable patients to more easily find the providers they seek across the Partners system. 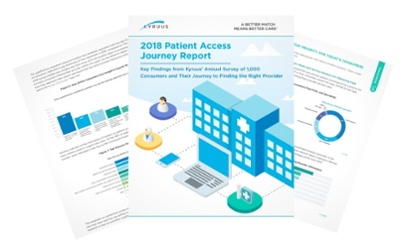 At Partners, Kyruus’ ProviderMatch solution will be incorporated into a public-facing physician search tool that will enable patients to search and filter for Partners providers by specialty, location, insurance and other attributes. The new search capabilities will help showcase the unique depth and breadth of Partners’ clinical expertise and improve patient access. The Kyruus platform takes a Big Data approach to analyze physician demographics, clinical expertise, accepted insurance and availability to rapidly identify providers who match a patient’s needs and preferences. HL7-based interfaces give clients the option to incorporate ProviderMatch into patient registration and scheduling workflows for streamlined appointment booking, improving patient access across all channels of patient engagement. Kyruus is an enterprise healthcare provider solutions company that helps health systems optimize their Patient Access, Referral Management and Care Coordination operations. Leveraging the cloud and a proprietary Big Data approach, the company enables the integration of massive amounts of information to create a single source of truth of providers. Kyruus helps health systems create customizable protocols for referral and scheduling across all channels of patient engagement to improve patient access and patient experience. To find out how a Better Match = Better Care™, please visit http://www.kyruus.com. Partners HealthCare is an integrated health care system, founded by Brigham and Women’s Hospital and Massachusetts General Hospital, that offers patients a continuum of coordinated and high-quality care. In addition to its two academic medical centers, the Partners system includes community and specialty hospitals, a managed care organization, a physician network, community health centers, home health and long-term care services, and other health care entities. Partners HealthCare is committed to patient care, research, teaching, and service to the community. Partners is one of the nation’s leading biomedical research organizations and is a principal teaching affiliate of Harvard Medical School. Partners HealthCare is a non-profit organization. To learn more, please visit http://www.partners.org.